Those are the two words come to mind when listening to Canadian superstar act Doc Walker’s latest album Go. The trio, who hail from Manitoba, Canada, have been consistently scoring hits since the late 1990’s but really didn’t become stars until 2003 when they released Everyone Aboard. Over the last six years, the group has evoloved into one of the premier country vocal groups in North America and nowhere is this more evident than on Go. Produced by Justin Niebank and primarily recorded in Nashville, Go features 10 strong tunes that showcase the sterling harmonies of Chris Thorsteinson, Dave Wasyliw, and Murray Pulver. The album, which features only two tracks not written by the band, starts off with the Top 10 hit “Coming Home,” a song which finds the distinctive lead vocals from Thorsteinson front and center as the harmonies of Wasyliw and Pulver kick in a-la the Eagles to give the song an ethereal quality until the verse and choruses kick in and by the end of the song a testament to the powerful love a man has for his woman has been proclaimed. While the theme of the song isn’t all that original, the lyrics aren’t standard committee fare either. One of the two outside tracks on Go is the Tebey/Eric Paslay/Terry Sawchuck-penned “Why,” a powerful lyrical rumination about a breakup that seems to have happened to the unlucky guy without him being told why it was happening. In another group’s hands this could’ve been handled in an over-the-top way but with Doc Walker it is smartly sung in a relaxed way. “The Hard Way” has a classic, familiar feel to the melody once the chorus kicks in that really could help the ballad cross-over in the USA while the outright best track on Go is “I’m Gonna Make You Love Me,” a song the trio co-wrote with Victoria Banks. While I wrote that “The Hard Way” could be a hit on the American charts, this song could be the group’s breakthrough single. It’s country, it’s sing-a-long worthy and it’s just a damn good song, the kind of song that’s a no brainer. It is just downright charming, as a guy pleads to make a girl love him, despite her constant rejections. “From Here” is another downright strong song from the trio’s well of songs and this one’s all about how young love turns to eternal love, despite the ups and downs that can come along with it. The second of the two tracks not written by the band is an interesting cover of Bruce Springsteen’s “Girls In Their Summer Clothes.” Like Elton John songs, Springsteen’s songs often work well in a country music environment (why hasn’t there been a tribute to The Boss yet?) and Doc Walker, who have recently been covering other genre songs like Genesis’ “That’s All” and Stephen Kellogg and the Sixers’ “Maria” on their last few albums, the band makes this song their own without ever abandoning the heart of the song. It’s a strong, lyrical song that really works well, especially since Chris Thorsteinson has a voice that can recall the Boss at times. The title track is another really good lyrical song that finds the band singing to a loved one as they go ‘have the time of their life,’ even if they don’t want the person to go, they realize that they have to let them go and experience life, even if it means that they ‘never come home.’ There’s nothing about Go that isn’t tastefully written, produced and performed. It’s such a good album that it’d be a crime for some smart label in Nashville to not pick it up and bring this talented band to a wider audience. Even if you cannot buy this album in the USA yet (previous albums are available on iTunes in America), here’s hoping that you soon will be able to. 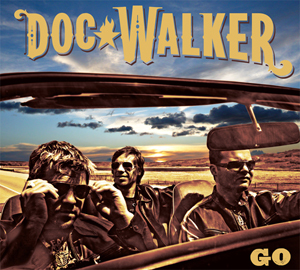 Until then you can purchase this album via Amazon (Canada) | The Doc Walker Website. You can also try and win a copy of Go by clicking here to enter our contest!